Melinda D. Blackwell is a member in the boutique property tax law firm of Blackwell & Duncan, PLLC. She is a graduate of Louisiana State University – Shreveport with a degree in Sociology and a recipient of her Juris Doctorate from Baylor University School of Law. Melinda is admitted to practice in Oklahoma and Texas, U.S. Supreme Court, U. S. Court of Appeals, Fifth Circuit and the U. S. District Court, Northern District of Texas. She has been heavily involved in property tax disputes throughout Texas for over twenty years. Upon graduating from law school in 1990, Melinda worked as an attorney for the Law Offices of Earl Luna until 1995. During that time, she represented appraisal districts, taxing units, and other government entities with property tax issues. 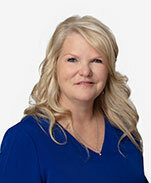 In 1995, Melinda joined Brusniak | Backwell, PC and became a partner in 2003. In 2013, Melinda formed the firm of Blackwell & Duncan, PLLC. She is the past Chair of the American Bar Association, Section of Real Property, Property Tax Committee; the past Vice-Chair of the American Bar Association, Section of Real Property, Land Use and Environmental Group, the past Chair of the American Bar Association, Section of Real Property, Land Use and Environmental Group, and the current Vice-Chair of the State Bar of Texas, Section of Taxation, Property Tax Committee; a member of the Institute for Professionals in Taxation; the Texas Association of Assessing Officers; and Texas Association of Property Tax Professionals.